View More In Place Cards & Place Card Holders - Page 2. - Deer - "Dear" unique design - The table numbers' design of "love dear" are very unique and fashion. This wooden table numbers will add a luxurious and vintage to the decoration of your tables and space! Nice table numbers or seating assignments. - Durable and stable - Each table number size at : 11 x 9 x 0.3cm / 4.33 x 3.54 x 0.12in. Pretty lightweight but still stable enough to be able to sit on the table alone. - Easy to install - These wooden table numbers comes with rectangle base, just inserting the table number inside the thick durable base. It is quite easy to inserting the table number inside the durable base. Easy to place on the guest tables, sturdy stand on, not easy to falling down. - Wood material - These wood table numbers are made of thick wood and cut with a precision laser. It's good for cycle use. - UNIVERSAL - With these table card stands, you will be prepared for any event. A simple way of marking the tables at your next reception, wedding banquet, office or catering event, anniversary, party, also great for cafes, diners and restaurants,etc. - Numbers from 1-20 - Helps you arrange or prepare the reception well, guide guests get seat orderly. From big birthday bashes and corporate events to wedding receptions and awards banquets, our wooden table numbers are the ultimate, must-have addition to party supplies! 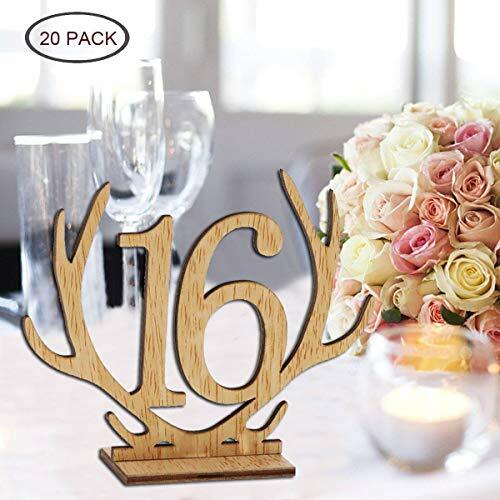 20PACK TABLE NUMBERS - Number 1-20 wood desk number holders with big rectangle base, it can make the numbers to fit into the base perfectly and can be easily put on the guest tables. DEER - "DEAR" UNIQUE DESIGN - The table numbers' design of "love dear" are very unique and fashion. This wooden table numbers will add a luxurious and vintage to the decoration of your tables and space! Nice table numbers or seating assignments. GOOD QUALITY TABLE NUMBERS - These wood table numbers are made of thick wood and cut with a precision laser. Pretty lightweight but still stable enough to be able to sit on the table alone. UNIVERSAL - Perfect for the special events and party banquets, such as weddings, Engagement Party, Rehearsal Dinner, Anniversary Party, Bridal Shower, Baby Shower or any party or event! Can be dress up your table with these beautiful wood table numbers. If you have any questions about this product by Wellinc, contact us by completing and submitting the form below. If you are looking for a specif part number, please include it with your message.